A year of travelling around the world, hundreds and thousands of flights, millions of passengers. eDreams has studied and analysed 60,000 reviews from sky travellers to draw up the list of the world's best full service airlines 2018. Turkish Airlines is an excellent airline, not by chance it is considered one of the world's best! The on-board staff were helpful and friendly, the flight was pleasant throughout. An extra bonus was the on-board food: excellent! I always travel with Aegean. The Sky Express service is unrivalled. Aegean offers excellent customer service and modern aircrafts. I love Swiss Airlines, a very comfortable trip! Very attentive on-board staff. 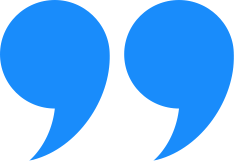 I've made a few trips with Swiss Airlines and I have always been very satisfied. Lufthansa is a first-class airline and offers excellent and reliable service. A very pleasant flight with extremely friendly on-board staff. I'll be very happy to fly with Austrian Airlines again! A very spacious aircraft and hostesses ready to cater to our every whim. Emirates, you are the best! I would recommend this airline to whoever wishes to travel worry-free. With Scandianavian Airlines everything went quickly and with no hitches! The Aeroflot flight was perfect and the service was excellent. The aircraft was clean and the hostesses very professional, plus the pilot updated us often and provided useful information. Everything was fine with TAP Portugal: perfect flight and great hospitality. The light snack and cake with a glass of wine and coffee were very much appreciated. 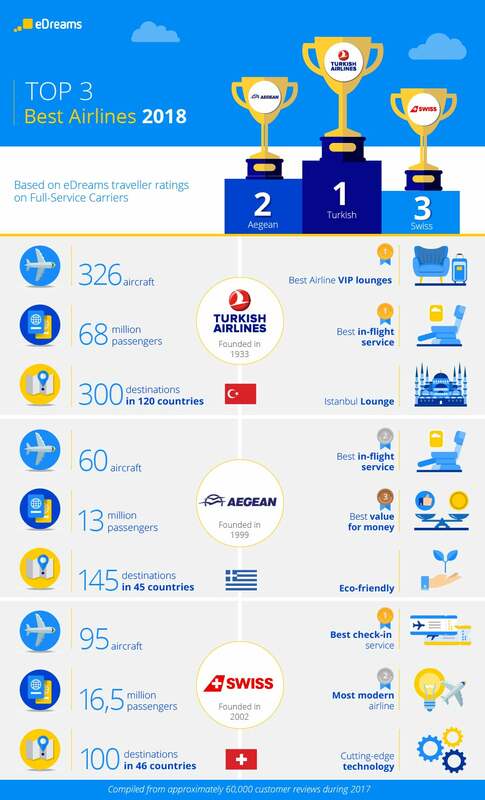 With the end of 2017 and the beginning of the new year, the moment has come to draw up the list of the world's best full service airlines Reviews from passengers in 2017 give the gold medal to Turkish Airlines who, in addition to claiming first place in the general ranking, also reach pole position for the categories of on-board staff and VIP lounge. In second place, Aegean Airlines, who continue their climb to the top, managing to gain the leader's position thanks to their stewards and hostesses always ready to satisfy every passenger's needs, and their excellent value for money. In third place, Swiss International Airlines, who gain three places in the general ranking, also managing to win a medal for the most modern aircrafts and the fluency of their check-in service. The rest of the list sees the entrance of Scandinavian Airlines, Aeroflot and Air France in the first ten places, whilst the 2016 prize-winning Emirates slips to 6th place, managing however to keep a tight hold on the entertainment and comfort categories. By contrast, Austrian Airlines record their best performance compared to 2016, leaping from tenth place to fifth place in the general ranking. Founded in 1933 as the national Turkish airline, Turkish Airlines has grown from its initial 5 aircrafts, to the current 326 aircrafts that grace the skies every day, transporting 68 million passengers to over 300 destinations in the 120 countries the airline serves. George It's fantastic the way Turkish Airlines manages to make even a short-haul flight special. Ciara What a perfect flight! I loved every minute of my journey from Dublin to Istanbul with Turkish Airlines. It's the on-board staff that make the difference for Turkish Airlines. Hospitality and friendliness are deeply rooted concepts for Turkish Airlines, concepts that are also evident in the Istanbul Lounges: reserved areas that offer passengers a moment of relax while they wait for their flight. Whatever your idea of relax, in the Istanbul Lounges you will find suites and refreshing showers, massages and entertainment to unwind, and a selection of the best specialities of Turkish and international cuisine to satisfy your appetite and get your journey off to a good start. Aegean Airlines started operating in 1999 and, since then, has reached ever more ambitious targets: 60 aircrafts, 145 destinations in 45 countries and more than 13 million passengers, these are just some of the victories that have taken the Greek airline to second place. Passengers could only give a positive rating for Aegean Airlines' value for money and their attention to environmental policies, something the Greek airline pursues with dedication and passion. Anonymous Excellent client focus both from on-board and ground staff with Aegean Airlines..
Catherine Aegean is an excellent airline, great value for money. We were also given an excellent meal. Since 2014, Aegean Airlines has introduced the use of new flight planning software that has significantly contributed to improving aircraft performance, allowing carbon dioxide emissions to be reduced by around 800 tonnes per month. In addition to this software, investment has been made in the realisation of lighter and more ergonomic seats which, together with other airline initiatives, has allowed CO2 emissions to be reduced by 515 tonnes per month. The youngest of the airlines to reach the podium is Swiss International Airlines: the main Swiss airline was created in 2002 and was made part of the Lufthansa Group in 2005. Its fleet is made up of 95 aircrafts, prize-winners for their modernity, safety and equipment, enabling 16.5 million passengers to reach 46 different countries and 100 various destinations in 2017. Epstein It was a pleasure flying with Swiss Airlines. Top! David Swiss Airlines offers very satisfying customer service. Swiss hospitality and culinary traditions are also offered at high-altitude: 45,000 chocolates are given out every day on board Swiss International Airlines flights, together with typical regional dishes and products. Breakfast, lunch or dinner: at whatever time of day you are flying, the dishes you can taste are made with fresh and high-quality ingredients from recipes originating from the 26 Swiss cantons.